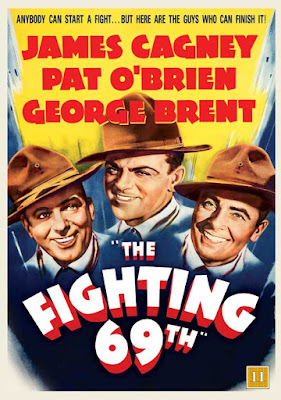 The Fighting 69th (1940) is one of the 1001 classic movies you should see. This World War I drama stars Pat O'Brien (left) as a Catholic priest who mentors doughboy James Cagney. Each Friday, I'm going to recommend a classic movie you should see (for the reasons behind the 1001 series and reviews of earlier films covered go here). This month I'm commemorating the 100th anniversary of the United States' entry into World War I by covering four films about the conflict. This week's selection is Warner Bros. flag-waving drama The Fighting 69th. The Fighting 69th follows the exploits of a group of soldiers who join the famous infantry regiment after the U.S. entry into World War I. 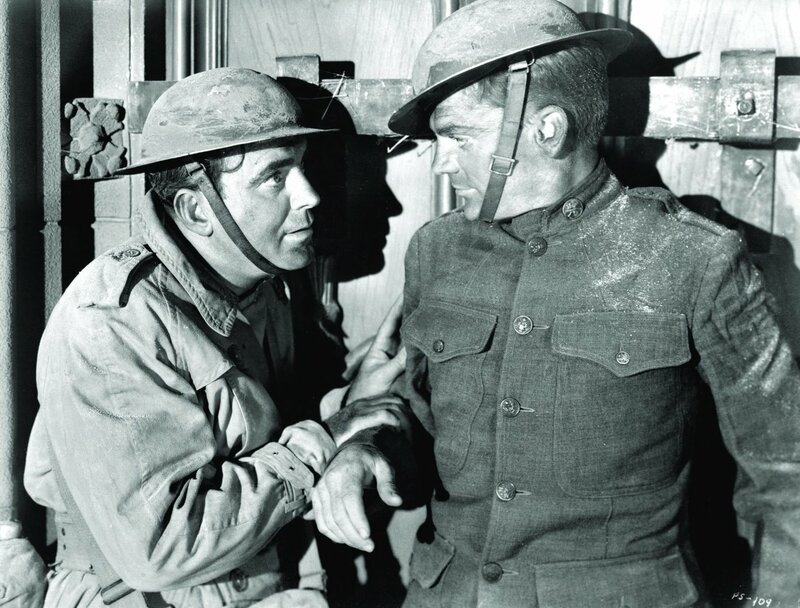 The raw recruits include insouciant New York City street hood Jerry Plunkett (James Cagney), who, despite starting fistfights, sassing superior officers, and running away during battle, wins the sympathy of kindly chaplain Father Francis Duffy (Pat O'Brien). While the other officers (George Brent and Alan Hale) are eager to send the antisocial Jerry packing, Father Duffy keeps giving Jerry chance after chance until he finally proves himself in battle. The Fighting 69th is based on the real-life exploits of the famous New York infantry regiment, which got its scrappy nickname from Confederate General Robert E. Lee during the Civil War. Warner Bros. executives thought that the headlines from war-torn Europe, Africa, and Asia would give Americans an interest in films about the 20th century's first worldwide conflict, so they gathered several of their top contract players for a flag-waving, guns-blazing spectacle that proved to be one of the highest grossing movies of 1940. Although The Fighting 69th features several battle scenes, its depiction of World War I is far different than last week's selection, the landmark antiwar film All Quiet on the Western Front (1930). By 1940, it was clear that the U.S. would enter World War II, and the old Hollywood studios, with Warner's in the lead, did their part to raise public support for the war effort by churning out a series of slickly produced and beautifully acted movies that glorified the U.S. role in World War I. The Fighting 69th was one of the first of these films, although it was quickly followed by the even more wildly successful Sergeant York (1941). 1. Fact vs. fiction. The characters and specific situations in The Fighting 69th are a blend of real events and old Hollywood storytelling. Father Duffy was a beloved military chaplain (there is a statue of him in Times Square) and the poet Joyce Kilmer (Jeffrey Lynn) did fight with the regiment, but Cagney's exploits are pure fiction. 2. Cagney and O'Brien. The Fighting 69th was the eighth of nine films for the close friends, and it is still a great example of the duo's unique chemistry. Cagney's raw defiance blends perfectly with O'Brien's aura of pious saintliness; at one point, they even have a "their eyes meet across a crowded room" series of closeups that were usually reserved for romantic situations. 3. Basic training. The Fighting 69th opens with a long and quite detailed sequence that takes the new recruits, and by default the audience, through each step in basic training. This served as a primer for soon -to-be-drafted young men on what they would be facing in a wartime army. 4. Yiddish. Cagney, who grew up on New York City's Lower East Side, was fluent in Yiddish. Watch for the scene where he speaks a little with a fellow recruit played by Sammy Cohen. 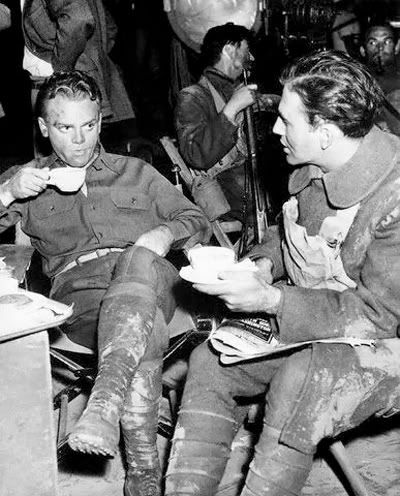 James Cagney and Jeffrey Lynn take a coffee break on the set of The Fighting 69th (1940). Other critics: The Fighting 69th has a 60 percent positive audience rating on Rotten Tomatoes and Leonard Maltin writes that the film is "overripe (but tough to dislike)" and features "incredible characterizations (especially Cagney's)" in a 2.5 star review for his Classic Movie Guide. Critics in 1940 were mixed about the movie's merits. The Variety critic didn't like Cagney's "despicable role" but still praised the film as a "vigorously melodramatic war picture." The New York Times' Frank Nugent dinged the "hokum" filled plot, but urged audiences to forget that and "think of it instead as the human, amusing and frequently gripping record of a regiments' marching off to war." The bottom line: The Fighting 69th is not one of old Hollywood's "great" films, but it's still first class entertainment. It's worth watching for both its value as a historical document and for Cagney's thrilling performance as a troubled soul who finally finds his courage. Availability: The Fighting 69th is available on DVD and video on demand. Next Friday I'll continue the June theme by looking at the romance The African Queen (1951).